It’s April in New York, and the day feels full of promise and hope, the way the early spring does after many cold, hard months of winter. I’m in a room packed tightly with 21 amateur musicians preparing for a performance the following month. The men tune and talk, plug guitars into amplifiers, and fiddle with endpins and rosin. The atmosphere is focused but warm, and there’s a buzz of excitement for the rehearsal to come. The concrete walls amplify the sounds of voices and instruments, and I’m thankful that the natural light pouring in the windows means that the fluorescent lights overhead remain off. The men exchange high-fives and fist bumps and the only thing that really stands out from the hundreds of other rehearsals I’ve observed is that the musicians are wearing prison uniforms. Not a guard is in sight in the crowded room (they are stationed in the hallways), and while the windows are frosted and barred, the rehearsal space doesn’t seem so different from many New York City public school classrooms. However, most NYC public schools don’t require extensive security clearance to enter the building, nor do you have to spend over an hour waiting to be screened and searched and then led to the classroom. Although the familiarity of attending a rehearsal and working with a roomful of musicians puts me at ease, the irony is not lost on me: I’m planning to spend my beautiful day locked inside Sing Sing Correctional Facility, one of America’s most famous maximum-security prisons. And I’m here to observe a new music program—one dedicated to changing inmates into artists. Built in 1826 and located in the rural upstate hamlet of Ossining, New York, on the scenic banks of the Hudson River, Sing Sing holds 1,700 prisoners. Over the years, it has housed some of New York’s most notorious criminals. Before the US Supreme Court temporarily halted executions in 1972, 614 men and women were put to death in the prison’s electric chair, dubbed “Old Sparky.” Those included Julius and Ethel Rosenberg, who were executed on the same day in 1953 for passing nuclear bomb secrets to the Soviets. In 1996, the prison started its Rehabilitation Through the Arts program, which has reduced the recidivism rate. The prison continues to advocate educational reform. Though it’s been less than a year, the program already has a waiting list with many men clamoring for spots. “Other men see the camaraderie we have now—the friendships, the smiles, the positive energy, the way we talk about the program and the way we seek each other out and support each other—they see us walking and talking with people we wouldn’t normally be walking and talking with—and they want in. They see how music is changing us,” says Joe, holding my gaze intently. Musicambia founding director Nathan Schram. 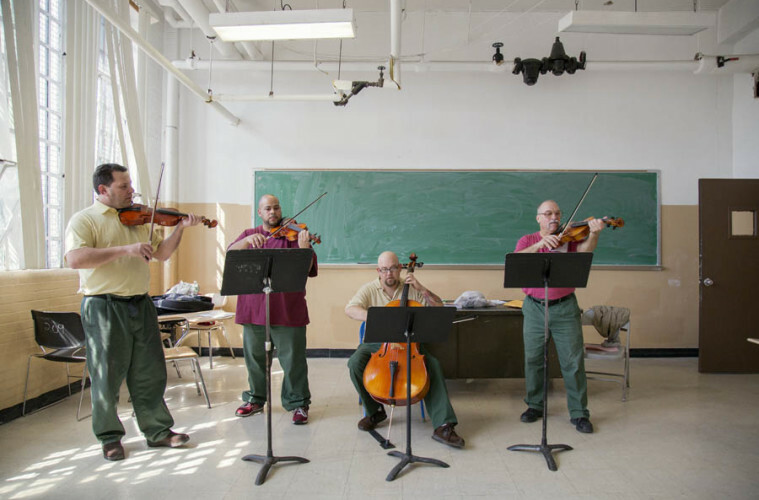 Encouraged to dream big by his mentor Eric Booth, a leader in the United States chapter of El Sistema, Schram started thinking about how he could be a part of bringing music into prisons. Schram discovered that the original El Sistema had started work in a few prisons in Venezuela. Booth, who is currently writing a book documenting El Sistema models around the globe, helped Schram to organize a trip to South America. 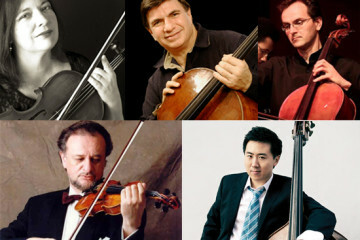 In October of 2013, one year before he launched Musicambia, Schram became the first American to observe El Sistema at work in Venezuelan prisons. The experience was life-changing, he says. The visit inspired Schram, but he felt a burden, too, like there was much work to be done—and it was up to him to accomplish it. Upon returning to the States, Schram blogged about each of his prison visits, posting pictures of what he had seen and talking to as many people as he could, building support and raising awareness and brainstorming about what a similar program could look like in his own country—a country that has more prisoners per capita than almost any other in the world. Schram wanted to play a role in transforming our correctional system. Musicambia faculty visit Sing Sing several times a month, teaching theory, ear training, and music reading for the first session of the day. The second session is dedicated to instrumental study—every participant is required to choose a “major”—and teachers work with small groups of strings, brass, voice, and piano students before everyone comes together for a large ensemble jam at the end of the day. 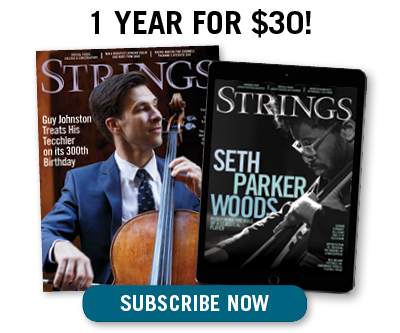 Because of the emphasis on daily, individual practice, every participant receives his own instrument (string instruments were generously donated by Classics for Kids, classicsforkids.com). Instruments and program participation are major incentives for participants to maintain good behavior—one infraction and they lose their instrument and the privilege of being in the program. Many of the inmates spoke to me about this, as did the education supervisor at Sing Sing, Olga Marchese. On the day of my visit, I meet with the star-spangled violinist, after listening to him practice a transcription of a Bach Invention (No. 4 in D minor, BWV 775). Flacco is humble and soft-spoken, but obviously proud, too, of his dedication these past five months. I ask him about his experience starting the violin and he laughs. Joe, the cellist, agrees. “It’s a real motivation and incentive to stay clean,” he says. “It’s like we’re growing up all over again while we’re here, but this time we understand what can be taken away from us, and so we’re making better decisions. The program means so much to all of us, and it keeps us out of trouble. Schram agrees, although his understanding is more nuanced. “The focus of Musicambia is on being an artist and the metamorphosis it can put you through—and for many of these guys, when they finally get out, that’s the biggest transition they are ever going to go through. And so for them to continue playing, and continue the consistency of something they have started in prison is really important. Music doesn’t care what the walls that surround it are—it crosses boundaries and grounds you in the present. “Growing up, music grounded me. We moved every two years because my dad was in the military, and the first thing we always did was find a private teacher and a youth orchestra for me. It didn’t matter where I was coming from or where I was going next. And it’s the same for these guys. Schram is eager for the future of Musicambia at Sing Sing, as well as at other facilities. The organization is awaiting 501(c)(3) nonprofit approval and is in conversations with staff at Rikers Island to pilot a program there in 2016. As we speak, the large ensemble is rehearsing Duke Ellington’s “It’s Freedom,” which the men are playing in a concert that’s part of Carnegie Hall’s Musical Connections program at Sing Sing. The men count their way through the piece and the room resonates with tapping feet and “ba’s” and “da’s” as they recite the unfamiliar jazz rhythms, counting the beats and bars under their breath. Finally the chorus comes around: “Freedom, it’s what you’ve got to have. Freedom.” The word echoes throughout the room. Surely the irony isn’t lost on the men, but neither does it seem to bother them. For now, music is their freedom. Learn more about the Musicambia initiative at musicambia.org.